I spoke to you yesterday about mobile marketing. Of course mobile marketing is a huge subject and and likely to grow faster than most people can keep up. But like with everything you need to start somewhere. First of a way of a little intro take a look at these short videos. They are from last year but very relevant. You also need to understand that mobile really merges the online and offline businesses. We all know that offline business get huge benefits from an online presence and social media an essential part of that over strategy. But many focus on the desktop and although that still may be where the majority of major goods are purchased it is not where the initial searches are made and where local business interaction begins. That is now mainly happening on mobile. So for any offline local business mobile is compulsory. The issue is that the technology moves so fast that very few businesses, especially small to medium sizes businesses just can’t keep up. as long as they can see a real return for their money. So its no good offering local business “clever ideas” if it doesn’t directly equate to more customers and/or more revenue. The same thing goes for throwing too much at the business. Go in with a big pitch, show off all the technology and you might just scare away your potential customers. One of the key marketing strategies you should have learned (or of not learn ii now) is that you need to go in with a relatively small, safe offer to get the business on board. Often that means offering huge value for relatively low cost. It’s your foot in the door so to speak. Fortunately there are a number of service that fit this criteria currently. 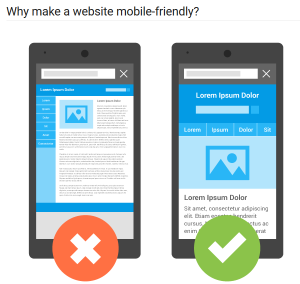 Google’s change to Google + (Google My Business) and Google’s “mobile friendly” requirement means that most websites (I.e. local businesses) do not even qualify for ranking in the so called “3 pack”. 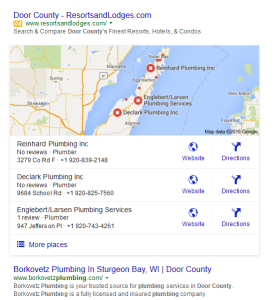 That’s the three local results shown at the top of any local search. Obviously these are sought after positions for local businesses and most can either understand the need to be there or can easily be convinced of the benefit. Of course you need to equate search position with business benefits or you will be on a a non-starter. As an online marketer you will probably have learned many skills that you can offer out to local business. Everything from building a website to running online ads and even list building. As an online marketer much of this may not seem like a valuable skill but in the offline world these are highly valuable. OK, we have talked about your foot in the door today but where do you even start to find the leads to get that far? Actually it’s ridiculously easy and I will talk about that in my next post.